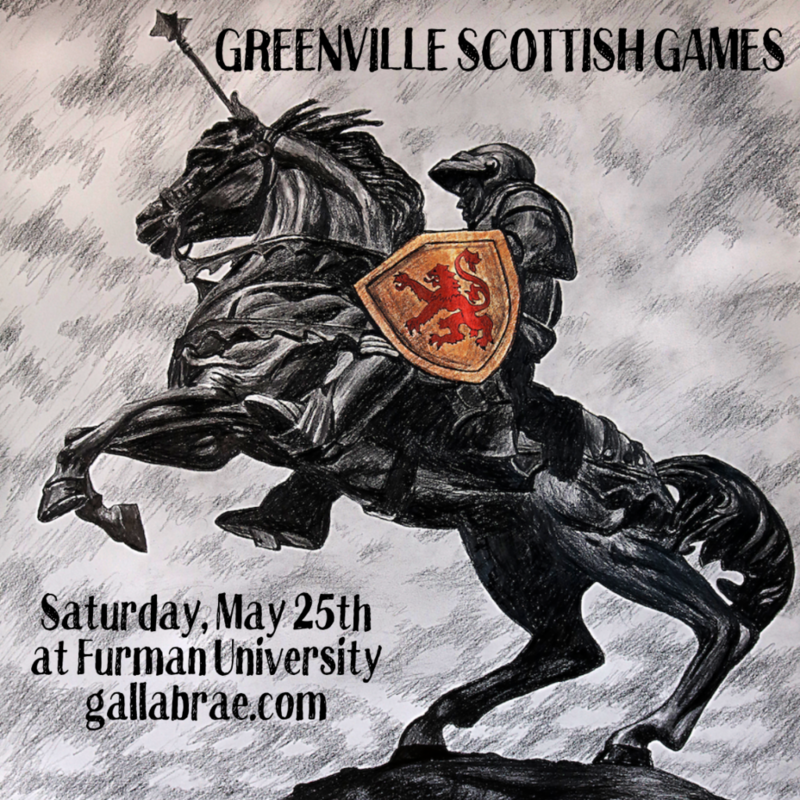 Our 2019 Greenville Scottish Games poster is special this year. The Games are at Furman University and their mascot is a Paladin and they have a famous statue of this noble night outside their football stadium. So, we’ve added a Scottish shield! Join us this Memorial Day Weekend. Ingles Markets are our presenting sponsor! The Scots brought a lot more to America than just the bagpipes; they brought independence, a fierce fighting spirit, a strong love of family and clan, a quirky sense of humor and enjoyment in their surroundings. We’re capturing all this and more with an overflowing series of activities bringing the best of Scotland and our rich Southern heritage together for your enjoyment. The Greenville Scottish Games anchors Gallabrae, and embodies the finest of Scottish traditions brought to new levels of excellence. 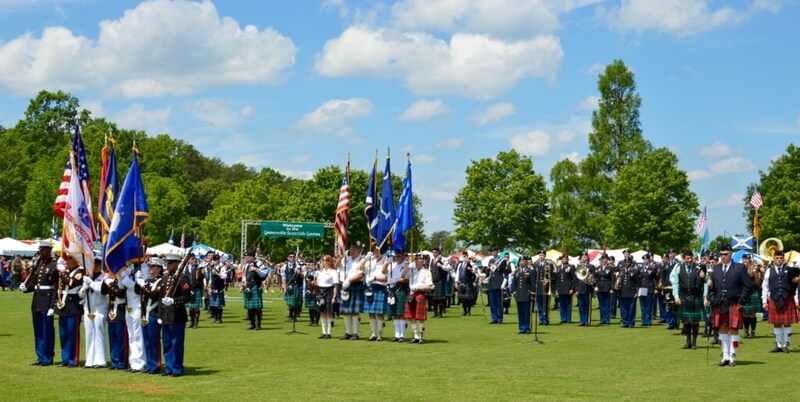 The Greenville Scottish Games began in 2006, and from its inception has consistently taken an innovative, fresh approach to celebrating Scottish heritage. Greenville is nestled in arguably the highest concentration of Scots-Irish descent in the country. The legacy left to us resonates throughout the Upstate in our place names, our attitude toward family, our sense of humor, and our love of country. There is so much to celebrate in this heritage, and so much to honor, that a small group of us said, heck, how hard can it be? Let’s establish a Games here in Greenville – and we needed a drop-dead gorgeous setting. We were offered a few landfill sites out in the County that somehow didn’t quite suit – maybe it was the methane pipes – and so when Furman University offered us the use of their athletic fields, we plopped the Games down in its new happy home and there we remain. We also made the decision to expand the Games into new directions, while at the same time building and improving all the traditional Scottish Games elements. This has brought in an increasingly diverse attendance of folks who may not be of Scottish heritage but who come to see all-day Border Collies, or the British Car Show, or take their children to Wee Scotland, etc. We are conducting a Miss Greenville Scottish Games as part of the Official Miss South Carolina Pageant, the only Games in the US to do so. We have launched an on-line, interactive newsletter,The Dirk, which is on the cutting edge of online marketing. We are an all-volunteer force comprised of wildly different backgrounds that have melded into a powerful cadre that produces an amazing multi-day, multi-event festival now known as Gallabrae. We are now ranked among the top Games worldwide by the Standing Council of Scottish Chiefs, and we were singularly honored in 2010 to have as our Most Distinguished Guest HRH The Prince Edward, the first time any member of the British Royal Family had attended a Games outside of Scotland. Gates open at 8:30am – Opening Ceremonies at 9:00am – Military Tribute at 11:00am – Greatest Scottish Happy Hour & Celtic Jam at 5:30pm. See you Memorial Weekend in 2019! This event is rain or shine and you can buy tickets at the gate on Saturday, May 25th 2019!